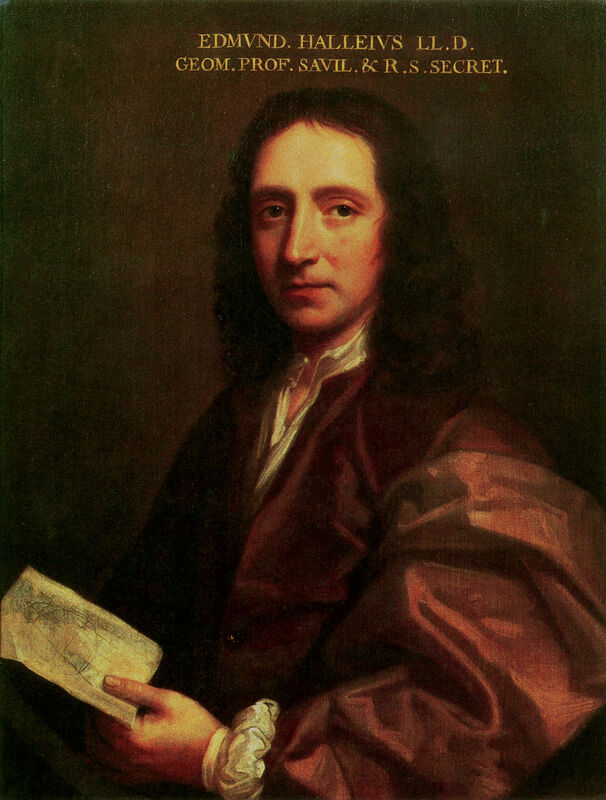 I have added the portrait of Edmund Halley and corrected what were obvious typos, such as ‘Coper-nicus’ and ‘in- struments. ‘ In all other respects, the text remains unedited [PJC]. It is well known that this distance of the sun from the earth, is supposed different by different astronomers. Ptolemy and his followers, as also Copernicus and Tycho Brahe, have computed it at 1200 semi-diameters of the earth, and Kepler at almost 3500; Riccioli doubles this last distance, and Hevelius makes it only half as much. But at length it was found, on observing by the telescope, Venus and Mercury on the sun’s disk, divested of their borrowed light, that the apparent diameters of the planets were much less than hitherto they had been supposed to be; and in particular, that Venus’s semi-diameter, seen from the sun, only subtends the fourth part of a minute, or 15 seconds; and that Mercury’s semi-diameter, at his mean distance from the sun, is seen under an angle of 10 seconds only, and Saturn’s semi-diameter under the same angle; and that the semi-diameter of Jupiter, the largest of all the planets, subtends no more than the third part of a minute at the sun. Whence, by analogy, some modern astronomers conclude that the earth’s semi-diameter, seen from the sun, subtends a mean angle, between the greater of Jupiter and the less of Saturn and Mercury, and equal to that of Venus, viz. one of 15 seconds; and consequently, that the distance of the sun from the earth is almost 14,000 semi-diameters of the latter. Another consideration has made these authors enlarge this distance a little more: for since the moon’s diameter is rather more than a quarter of the earth’s diameter, if the sun’s parallax be supposed 15 seconds, the body of the moon would be larger than that of Mercury, viz. a secondary planet larger than a primary one, which seems repugnant to the regular proportion and symmetry of the mundane system. On the contrary, it seems hardly consistent with the same proportion, that Venus, an inferior planet, and without any satellite, should be larger than our earth, a superior planet, and accompanied with so remarkable a satellite. Therefore, at a mean, supposing the earth’s semi-diameter, seen from the sun, or which is the same thing, the sun’s horizontal parallax, to be 12 seconds and a half, the moon will be less than Mercury, and the earth larger than Venus, and the sun’s distance from the earth come out nearly 16500 semi-diameters of the earth. I shall admit of this distance at present, till its precise quantity be made to appear more certain by the trial I propose; not regarding the authority of such as set the sun at an immensely greater distance, relying on the observations of a vibrating pendulum, which do not seem accurate enough to deter-mine such minute angles; at least, such as use this method will find the parallax sometimes none at all, and sometimes even negative; that is, the distance will become either infinite, or more than infinite, which is absurd. And it is scarcely possible for any one certainly to determine, by means of in-instruments, however nice, single seconds, or even 10 seconds; and therefore, it is not at all surprising, that the exceeding minuteness of such angles has hitherto baffled the many and ingenious attempts of artists. While I was making my observations in the island of St. Helena, about 40 years since, on the stars round the south pole, I happened to observe, with the utmost care, Mercury passing over the sun’s disk: and contrary to expectation, I very accurately obtained, with a good 24-foot telescope, the very moment in which Mercury, entering the sun’s limb, seemed to touch it internally, as also that of his going off; forming an angle of internal contact. Hence I discovered the precise quantity of time the whole body of Mercury had then appeared within the sun’s disk, and that without an error of one single second of time; for, the thread of solar light, intercepted between the obscure limb of the planet, and the bright limb of the sun, though exceedingly slender, affected my sight, and in the twinkling of an eye, both the indenture made on the sun’s limb by Mercury entering into it, vanished, and that made by his going off, appeared. On observing this I immediately concluded, that the sun’s parallax might be duly determined by such observations, if Mercury, being nearer the earth, had a greater parallax, when seen from the sun; for, this difference of parallaxes is so very inconsiderable, as to be always less than the sun’s parallax, which is sought; consequently, though Mercury is to be frequently seen within the sun’s disk; he will scarcely be fit for the present purpose. There remains therefore Venus’s transit over the sun’s disk, whose parallax, being almost 4 times greater than that of the sun, will cause very sensible differences between the times in which Venus shall seem to pass over the sun’s disk in different parts of our earth. From these differences, duly observed, the sun’s parallax may be determined, even to a small part of a second of time; and that without any other instruments than telescopes and good common clocks, and without any other qualifications in the observer than fidelity and diligence, with a little skill in astronomy. For we need not be scrupulous in finding the latitude of the place, or in accurately determining the hours with respect to the meridian; it is sufficient, if the times be reckoned by clocks, truly corrected according to the revolutions of the heavens, from the total ingress of Venus on the sun’s disk, to the beginning of her egress from it, when her opaque globe begins to touch the bright limb of the sun; which times, as I found by experience, may be observed even to a single second of time. But by the limited laws of motion, Venus is very rarely seen within the sun’s disk; and for a series of 120 years, and upwards, is not to be seen there once; viz. from 1639, when Mr. Horrox was favoured with this agreeable sight, and he the first and only one since the creation of the world, down to 1761; at which time, according to the theories hitherto observed in the heavens, Venus will pass over the sun on May 26 in the morning; so that (vide Phil. Trans. N0 193) at London, nearly at 6 o’clock in the morning, she is to be in the middle of the sun’s disk, and but 4 minutes more southerly than his centre. The duration of this transit will be almost 8 hours; viz. from 2 till near 10 o’clock in the morning. Consequently her ingress will not be visible in England: but the sun at that time being in 16° of Gemini, and almost in 23° of north declination, will be seen not to set throughout the whole northern frigid zone; and consequently the inhabitants of the coast of Norway, as far as its northern promontory, beyond the town of Drontheim, may observe Venus entering the sun’s disk; and perhaps this ingress into the sun at his rising may be seen by the inhabitants of the north of Scotland and those of Zetland. But when Venus is nearest the sun’s centre, he will be vertical to the northern coasts of the gulph of Ganga, or rather of the kingdom of Pegu; and consequently, in the neighbouring countries, when the sun shall, at the ingress of Venus, be almost 4 hours distant to the east, and almost as many to the west at her egress, her apparent motion within the sun’s disk will be accelerated almost twice as much as in the horizontal parallax of Venus from the sun; because Venus at that time moves retrograde from east to west; while in the mean time an eye, on the surface of the earth, is carried the contrary way, from west to east. Supposing the sun’s parallax, as was said, to be 12 seconds and a half, Venus’s parallax will be 43 seconds; and subtracting the sun’s parallax, there will remain half a minute at least for the horizontal parallax of Venus from the sun, and consequently, Venus’s motion will be accelerated ¾ of a minute at least by that parallax, while she passes over the sun’s disk, in such elevations of the pole as are near the Tropic; and still more so near the equator. For Venus will at that time accurately enough describe within the sun’s disk 4 minutes an hour; and consequently, at least 11 minutes of time (by which the duration of this eclipse of Venus will be contracted by reason of the parallax) answer to ¾ of a minute. And by this contraction alone we might safely determine the parallax, provided the sun’s diameter and Venus’s latitude were very accurately given; which yet we cannot possibly bring to a calculation, in a matter of such great subtlety. We must therefore have another observation, if possible, in places where Venus possesses the middle of the sun at midnight, viz. under the opposite meridian, that is, 6h or 90° more westerly than London, and where Venus enters the sun’s disk a little before his setting, and goes off a little after his rising; which will happen in the said meridian in about 56° of N. lat. that is, at Nelson’s harbour in Hudson’s Bay. For, in the neighbouring places Venus’s parallax will protract the duration of the transit, and make it at least 6 minutes longer; because while the sun seems to tend under the pole from west to east, these places on the earth’s surface will seem to be carried with a contrary motion towards the west, that is, with a motion conspiring with the proper motion of Venus; consequently Venus will seem to move slower within the sun’s disk, and continue longer on it. If therefore in both places this transit happen to be duly observed by proper persons, it is evident that the Mora will be longer by 17 entire minutes in Nelson’s harbour, than in the East-Indies; nor does it matter much whether the observation be made at Fort St. George, commonly called Maderas, or at Bencoolen on the western coast of the island of Sumatra near the equator. But if the French should incline to make the observation, Pondicherry on the western coast of the gulph of Ganga , at the elevation of 12°, will be a proper place for that purpose: and for the Dutch, their famous emporium Batavia is a fit place. And indeed I would have several observations made of the same phenomenon in different parts, both for further confirmation, and lest a single observer should happen to be disappointed by the intervention of clouds from seeing what I know not if those either of the present or following age shall ever see again; and upon which, the certain and adequate solution of the noblest, and otherwise most difficult problem depends.Therefore again and again, I recommend it to the curious strenuously to apply themselves to this observation. By this means, the sun’s parallax may be discovered, to within its five hundredth part, which will doubtless seem surprising to some: but yet, if an accurate observation be had in both the places above-mentioned, it has already been shown that the duration of these eclipses of Venus differ from each other by 17 entire minutes, on the supposition that the sun’s parallax is 12½ seconds. And if this difference be found to be greater or less by observation, the sun’s parallax will be greater or less nearly in the same ratio. And since 17 minutes of time answer to 12½ seconds of the sun’s parallax; for each second of the parallax there will arise a difference of upwards of 80 seconds of time; therefore, if this difference be obtained true within 2 seconds of time, the quantity of the sun’s parallax will be got to within the 40th part of one second; and consequently his distance will be determined to within its 500th part; at least if the parallax be not found less than what I have supposed it; for 40 x 12½ is 500. Here I have had no regard to the planet’s latitude, both to avoid the trouble of a more intricate calculation, which would render the conclusion less evident, as also on account of the motion of the nodes of Venus not being hitherto discovered, and which can only be duly determined by such conjunctions of the planet with the sun as this. For it was only on the supposition, that the plane of Venus’s orbit is immoveable in the sphere of the fixed stars, and that her nodes would continue in the same places as they were in 1639, that it was concluded, that Venus would pass 4 minutes below the sun’s centre. But if in 1761 she should pass more southerly, it will be evident, that there is a regression of the nodes; and if more northerly, that there is a progression of them; and that at the rate of 5½ minutes in 100 Julian years, for each minute by which the path of Venus will at that time be more or less distant from the sun’s centre than the said 4 minutes. But the difference between the durations of these eclipses will be somewhat less than 17 minutes, by reason of the southern latitude of Venus; but greater if, by the progression of the nodes, she shall pass over the sun to the north of his centre. But for the sake of such as are not thoroughly acquainted with the doctrine of parallaxes, I shall further explain the matter both by a figure and a somewhat more accurate calculation. Therefore, supposing that at London, May 25, 17h55m, 1761, the sun be in 15° 37′ of Gemini, and consequently that at his centre the ecliptic tends towards the north in an angle of 6° 10′; and that the visible path of Venus within the sun’s disk at that time descends towards the south, forming an angle with the ecliptic of 8° 28′; then the path of Venus will tend a little towards the south in respect of the equator, intersecting the parallels of declination in an angle of 2° 18′. Supposing likewise that Venus be near the sun’s centre at the said time, and distant from it towards the south 4 minutes, describing, by a retrograde motion on the sun’s disk, 4 minutes an hour. The sun’s semi-diameter will be nearly 15′ 51″, and that of Venus 37½”. And supposing, for trial sake, the difference of the horizontal parallaxes of Venus and the sun to be 31″, such as it is on the supposition of the sun’s parallax being 12½”. Therefore let a small circle, as AEBD, fig. 3, pl. 5, be described from the centre C, whose semi-diameter let be 31″, representing the earth’s disk, and in it drawing DabE and cde the ellipses of the parallels of 22 and 56° N. lat. in the same manner as is now used by astronomers for constructing solar eclipses: and let BCA be the meridian in which the sun is, to which let be inclined the right line FHG, representing the path of Venus, in an angle of 2° 18′, whose distance from the centre C let be 240 such parts as BC is 31; and from C let fall the right line CH perpendicular upon FG. Then supposing the planet in H at 17h55m, or 5h55m in the morning, let the right line FHG be divided into the horary spaces III; IV, IV; V, V; VI, &c. equal to CH, that is, 4 minutes. Let the right line KL be also equal to the difference of the apparent semi-diameters of the sun and Venus, or 15′ 13½”. Then the circle, described with the radius KL, and from any point within the small circle, representing the earth’s disk as a centre, will meet the right line FG in the point denoting what o’clock it is at London, when Venus shall touch the sun’s limb in an angle of internal contact, in that place of the earth’s superficies that lies under the assumed point on the disk. And if a circle, described from the centre C and with the radius KL, meet FG in the points F and G, the right lines FH, HG will be = 14′ 41″, which Venus will appear to pass over in 3h40m. Therefore F will fall upon 2h5m at London , and G upon 9h35m in the morning. Whence it is evident, that if the earth’s magnitude should vanish, as it were, into a point, by reason of the immense distance; or if, divested of its diurnal motion, it should always have the sun vertical to the same point C, the entire mora of this eclipse would continue for 7¾ hours. But in the mean time while the earth revolves with a contrary motion to that of Venus through 110° of long. and consequently the duration of the said mora is shorter, suppose by 12 minutes, it will be nearly 7h8m, or 107°. Now in the meridian itself Venus will be near the sun’s centre at the eastern mouth of the Ganges, where the elevation of the pole is about 22°. Therefore that place will be equally distant from the sun on both hands, in the moments of the planet’s ingress and egress, viz. 53½°; as the points a, b, in the greater parallel DabE. But the diameter AB will be to the distance ab, as the square of the radius to the rectangle under the sines of 53½° and 68°, that is, as 1′ 2″ is to 46″ 13″‘; and on making a due calculation, I find that the circle described with the radius KL, from the centre a, will meet the right line FH in the point M, at 2h20m40s; but described from the centre b, it will meet HG in N, at 9h29m22s at London; consequently, the whole body of Venus will be seen the banks of the Ganges, within the sun’s disk, for 7h8m42s. Therefore we have rightly supposed its duration 7h8m, since here a part of a minute is inconsiderable. But adapting the calculation to Nelson’s harbour, I find that Venus shall pass over the sun’s disk, when he is just about to set, and emerge out of his disk immediately after his rising, that place in the mean time being carried through the hemisphere opposite to the sun from c to d, with a motion conspiring with that of Venus. Therefore the mora of Venus within the sun’s disk will become longer by reason of the parallax, suppose by 4 minutes, so as entirely to be 7h24m or 111° of the equator. And since the latitude of the place is 56°, it will be as the square of the radius is to the rectangle under the sines of 55½° and 34°, so is AB = 1’ 2″ to cd = 28″ 33″‘. And on duly making the calculation, it will appear, that the circle, described from the centre c, with the radius KL, will meet the right line FH in O, at 2h12m45s; but described from the centre d, it will meet HG in P, at 9h36m37s. Therefore the duration of the mora at Nelson’s harbour will be 7h23m52s, viz. greater than at the mouth of the Ganges by 15ml0s of time. But if Venus should pass without latitude, the said difference will become 18m40s; and if she shall be 4 minutes more northerly than the sun’s centre, the difference will be increased to 21m40s, and will be still greater by increasing the planet’s N. lat. From the above hypothesis it follows, that at London Venus will rise when entered into the sun, and at 9h37m in the morning in her egress touch internally the sun’s limb, and quite leave his disk not before 9h56m. * The transit of Venus in 1761 proved much less favourable to the proposed purpose than Dr. Halley expected. The motion of Venus’s node not being well known, she passed much nearer the sun’s centre than he supposed she would; which made the places he pointed out for observing the total duration not proper for the purpose; indeed the entrance of Venus on the sun could not be seen at Hudson’s Bay. He made a mistake too in the calculation, in taking the sum instead of the difference, of the angle of the ecliptic with the parallel to the equator, and the angle of Venus’s path. This translation of Halley’s paper is taken from the Abridged Transactions of the Royal Society, Volume VI, pp.243-249, published in 1809.